Aww ‘tis the season. You can smell it in the air, cinnamon and fireplaces. You can see it in the cherubic rosy cheeks of children and the sparkle in their dancing eyes. You can hear it in the cursing and grunting of our mail carrier as he attempts to shove a stack of darling embellished Christmas cards and letters in our ridiculously tiny, albeit, adorable mail box. The season is upon us. I have a confession. I’m hiding all of the cards and letters. Can’t handle how shiny and coifed you all AND YOUR CHILDREN are. When did you find a day when no one had pink eye or green snot? How was it not windy? Why isn’t at least one person crying? How are you all matching? And when did your kid start using hair product and get an actual haircut that didn’t happen during a round of monthly buzz cuts from dad?? There may have been a memo saying it was time for us to grow up, but more than likely a baby ate it, a toddler hid it, or a preschooler deleted it. Second confession, we have exactly 87 million Christmas ornaments and not one of them is on the tree. I did not start out as Scrooge. Really! We even had a tree trimming party, danced to Christmas music and decorated. Friday, December 9th 2016 shall live in infamy in the memories of our family. I found out I had Strep the day before and made appointments to get our kiddos checked at 9:00 Friday morning. Strep gets passed around our family like a bottle of Hot Damn at a highsch…I mean, college bonfire. Four out of five kids tested positive and since it was a Friday we knew the other kid would likely come down with an acute case at 5:01 after their office closed, so our pediatrician called in antibiotics for all of the kiddos. Here’s an interesting fact: when your pharmacy calls to say your prescriptions are ready, they do not mean children’s antibiotics are already mixed. Also, a ten day course of amoxicillin comes in two bottles. For us that was ten bottles that needed mixing, while we sat in the drive thru, with a carload of sick (read MEAN) children while an elderly man in the car behind us honked and hollered things that were definitely NOT seasons greetings. He did mention God and Jesus, I just don’t think he knows them. I offered to pull around, but the pharmacist firmly told me the man needed to wait his turn and that we needed to finish our transaction. When we got home I gave the kiddos all their first round of meds, fed them lunch and then started to make the brownies I promised to bring to a Ladies Christmas party I was going to that evening. While getting the ingredients down I accidentally pulled down a Costco sized container of sprinkles. It hit the counter of our open-concept kitchen and burst forth. Teeny tiny dots of multicolored sugar all over the kitchen and living room. The children, delirious with fever, thought it was like confetti and a parade as I stood, horror struck, that i couldn’t even begin to think of the best way to handle this. So i barricaded the kiddos in the playroom, and began the painfully slow clean up process. I tried sweeping but the sprinkles were so tiny they just scattered and neither type of broom I had could get them. They also were either possessed by some sort of magnetic energy or by Satan himself because every time I brought the vacuum wand near, half of them would scatter. It took half an hour to get most of them (we are still finding them). Ok, back to the brownies. I stepped out to the fridge in the garage to get another carton of eggs to find our dogs had lost their dang minds. They were in the garage because it was cold outside and by way of thanks they found the 50 pound bag of dog food and gorged themselves on it and then barfed and relieved themselves all over the garage with reckless abandon. I went to our real tree to find nearly all the ornaments had been pulled off compliments of our two year old and 15 month old. They had used my distractions to full revelry. Even cleverly commandeering the chairs from the barricade I had made to help them reach higher on the tree than ever before. Ornaments and pine needles everywhere. This is the part of the story where I recognized these situations were teachable moments and I sat my darling children down and explained to them about sin and why we celebrate this time of year, that our mistakes are why Jesus was born, that this season reminds us of grace we could never deserve. Um no. I went back in the garage, yanked the attic ladder down, grabbed the empty ornament tote and threw every dang ornament back in there and snatched the rest off the tree, too. I climbed back up the ladder awkwardly and huffily and threw that tote back in the attic. Then I vacuumed up all the pine needles and surveyed our now forlorn Charlie Brown looking tree with lights barely clinging to bare branches. I held back tears, baked brownies, cooked dinner, gave medicine to kids, gave baths to babies, wiped my armpits with baby wipes and reapplied deodorant because there was no time for a shower, and waited for the firefighter to come home. Our clear canister vacuum full to the brim with pineneedles and rainbow sprinkles. The most joyless Christmas tree in all the land. The stockings no longer hanging from the mantle but balled up on the floor of our room. The kitchen a disaster from the brownies I made and took away. I imagine it was a shock to his senses to realize he was married to a real life version of The Grinch. At the party I fell apart and just shared the craziness. I’m generally awkward at parties, but I would say this was definitely my shining moment in buzzkillery. And on that lighthearted note, we played our stealing Santa game. 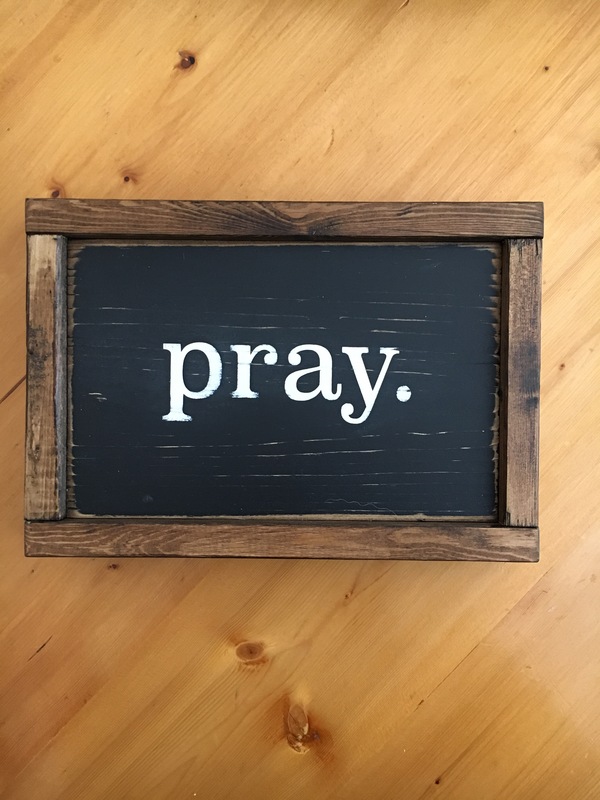 I opened my chosen gift to find a simple frame outlining a handmade canvas with the word “pray.” painted in large typewriter font. It was so pure and simple and in that moment reminded me that I don’t have to carry everything. I have an open invitation to crawl into the arms of my Father and weep and be comforted. That the moments that are too much are too much because I’m not seeing them with the wisdom of timeless Grace, that these moments are only that and that my Father delights in me. And I know that day was only ridiculous and not earth shattering, but when I share the small hardships with Him it softens me to share the too high mountains and deep, impossible canyons. Also, no one dared steal that gift from me. Post Script: As soon as I got home that night our baby started crying. We walked in to find him and all his bedding covered in vomit. We spent the entire night bathing and comforting him and changing his bedding and cleaning up puke. All night long. And then two nights later the other four kids came down with it and took turns vomiting all night long. Children do not vomit any color but red and it is their duty to vomit more in their bed, on themselves and carpet than in the toilet or provided trash cans. There were at least 15 loads of laundry completely dedicated to that weekend of stomach bug. There was carpet cleaning and disinfecting EVERYTHING. And doing it all, lovingly and gently on very little sleep. At the level of stress I had left my house on Friday, if my heart hadn’t been changed, I don’t want to imagine how ugly and bitter my heart would have become. Instead, in the thick of it, we found times to giggle, to come together, and to be thankful. But we still don’t have ornaments on the tree. And next year we are getting a fake one. And maybe we will send out a Christmas card, but it’ll probably have to be with a picture of our feet, cuz that many faces is too hard. Merry Christmas from the Park Family! I am a very rational, conscientious shopper when I am not pregnant or breastfeeding. Basically I have not shopped smart since the Bush Administration. But it’s ok because I am part of an online resale group. I have been able to recoup some compensation for my poor choices. Socialism scares me, y’all. And I have been struggling to understand how so many smart people I know think it is what our country, our people, need. As I have tried to understand and consider the individuals I know who are proclaiming it’s merit I realize the problem is worldview and the lenses we see through. Before I anger and alienate you all, please know this: I respect and admire your compassion and hearts for people. Truly. Those qualities are important. I believe they are necessary as we live with and love our fellow man. I’m going to share my worldview and lens. I’m going to give you more than rhetoric and internet articles, more than speeches that have been written, edited, practiced, and soundbited. I grew up poor in Clovis, New Mexico. The kind of poor where in the winter we ate breakfast in the tiny bathroom of our house because we had a little spaceheater in there and it was the only room you didn’t need a coat on to be in. Before school, I would sit on the toilet and eat my cereal. I have seen a bare pantry. I never went to the dentist as a child because that was an extravagance. In fact, what I asked for for my high school graduation gift was a trip to the dentist to try to get my teeth whitened from the stains that came from the water I drank as a kid. I remember when we moved to Lubbock and seeing all the kids with braces and thinking they must all be so rich! I got one pair of shoes every year when Payless had a sale. The same pair of shoes every year, because they would “go with everything”, mostly because they were so ugly no one would really care to look at them. I remember one year receiving a bag of hand-me-downs from my cousin Emily. In those hand-me-downs was a pair of red shoes. Y’all. To this day I remember those shoes and how brokenhearted I was when I outgrew them. Even now, when my mom shows me pictures of those faded red Keds with holes in them and torn laces and tells me they weren’t in much better shape when I first received them, the eyes from my childhood refuse to believe it. I was wearing Ruby slippers. So there’s a glimpse of being a poor child. Here is what being poor, teenaged, married parents looked like: My mom worked selling things we could never afford. She clipped coupons, went to the grocery store with a very specific list of meals and needs and tallied every price before putting anything in her basket. She had an envelop with cash and held her breath as the cashier rang things up. She bought things in bulk and divided proportions exactly. She was smart and kept up with every money thing in our life down to the penny. My dad worked every job he could. He worked night shifts in a meat packing plant where he had a knife pulled on him cuz some guy was having a bad day. He put up with ignorant bosses who said ugly things to him because his name was “Neko” and he had darker skin. He worked dangerous jobs, long hours and wanted better for his family than was ever given to him. My parents did everything they could to protect me from the harsh realities where we lived. Things like gangs, prostitution (our next door neighbor for a time, I remember she would give me french fries and candy through her window), spousal and child abuse, drugs, and alcoholics everywhere. I remember when a child molester moved back in with his family across the street after he got out of jail. I remember because it was the first time my mom ever talked to me about some of the horrors we coexisted with. I can still hear our fat neighbor screaming at her skinny meek husband and their children. Screaming so loud while their yard full of starving dogs tried to out-volume her. They never could. And here’s a glimpse at the lives of my playmates: many of my friends didn’t have a dad. Or they weren’t sure which guy was their dad. Or they were afraid of their dad coming back, or they just didn’t care. The dads who were there were often there in the middle of the day in their underwear drinking beer. One dad watched the Simpsons in his underwear while drinking beer and would talk to his kid and me about how fat his wife was. I had friends who didn’t go to school. I had friends who smelled bad because they had animals living in their bathtub. I had friends who shared their bed with many siblings. Friends who had disabilities that come from being in the womb while their mom continued a serious drug or alcohol habit. The habit continued while the child struggled to find something edible in the house. I had friends whose parents would give them adult sized clothing that they would then wear for years while their parents always had booze and cigarettes and whatever else. And I had sweet friends who lived things we don’t talk about. I knew when my friends families got money from the government because their parents bought new stuff. We never bought new stuff. My parents worked too hard and too much making too much money for us to get anything new. We did not qualify for government assistance. I wonder what if they had just quit? What if my dad decided to bail cuz our life together was too freaking hard? What if they had fallen into ugly habits that would have destroyed their drive? What if my dad decided he was too damn good for a nasty night job at a meat packing plant? What if they had bought a bunch of temporary crap rather than squirreling pennies away? Eventually their scrimping and saving and hard work paid off. My dad, who was a smart, personable guy, was given a job that he was great at. We moved and he was promoted and made important contacts and did well. My mom no longer needed to work. So what did she do? She became very involved in our schools and she volunteered a lot of her time for a local pregnancy center that reached out to women in crisis situations. She loved those girls because she KNEW them. She cared and gave deeply. She loved. My parents taught us to see and care about people. I only know of one other family who made it out of there. My takeaway: if you rob someone of their drive, of their need to try, you rob them of dignity and you rob future generations. You step on hard working people to such a degree that it might be tempting for them to give up because why should they work so hard at such hard jobs to pay for other people to have things that they themselves cannot afford? I have no answers. I just have this lens. And I’m asking you to look through it for a moment. Many of you have had privileged lives though you may not recognize them as such. Many of you believe in socialism because you have only known good people in good situations. I am not against helping people. I am not against doing for those who cannot. Today’s post starts with a prayer, which is ironic, given it was the absence of prayer that brought about this post. My prayer as I write is that He will be glorified in this flawed human’s account. My baby has RSV. This may not sound too bad to some, but I have seen what it can do in one of our other kiddos. I’ll stick a pin in that and maybe another day share what that looks like, even now. For now, our five month old is struggling with it. I am on high alert constantly, suctioning his nose, monitoring his fever, doing everything I know to do to help him breath and ease his constant cough. Our three year old is also not feeling well. She has a cough and really just wants to rest. Our toddler is not enjoying this energy (or lack of) in our house. She is used to a faster pace, and a sister to play, and a mommy who is more interactive and playful. Normally when she gets in an ornery mood, we switch up the activity. We go outside or go somewhere. Right now that just isn’t possible, and she has instituted a reign of terror to let us know how she feels. She is hitting, hair pulling, screaming, throwing things. It’s awful. At one point, I was nursing Keegan to put him down for a nap and Amelia went to her room to escape angry toddler and Eva followed her and started beating on the shut door, screaming. I had my phone near me and I almost texted my mother-in-love for help, I almost prayed, I almost lots of things. Instead, I crafted a funny way of sharing the moment on facebook, and posted it. Sat there for a few minutes and deleted it. And then in a passive aggressive moment of righteous indignation with myself, I also deleted the facebook app. Because I’m very self aware and also holy. I long for connection with people, but I have created this online fantasy life that is annoying. It is the double edge of the social media sword. See, I’m not a social person. More than likely you wouldn’t notice me, unless by some miracle you know me well. But facebook has given me the opportunity to show that I do have a personality in a context that I am comfortable with, unfortunately I am a people pleaser who subscribes to sharing only the shiny moments. I like those “likes”. And I dislike the paltry number of likes that a Debbie Downer post gets. My facebook life is tinsel y’all, it’s shiny and appealing, but ultimately lacking substance. Don’t get me wrong. I do love sharing moments that make us all giggle and I love seeing those moments, too. Blah blah blah I think this could turn into a post for another day, and it’s not the point of today. Basically, I’m saying I was acting like a stupid island, stewing in an ocean of ugly thoughts without reaching out in a real way. And even when I pulled my phone out again to text my mom-in-love I couldn’t because of pride. So then I started to pray, but Eva’s tantrum was so loud and my baby couldn’t breath and…I was too angry. It was Cindy (my mom-in-love). Nope. Can’t answer. This moment is too sucky. She left a voicemail. We don’t leave voicemails. When Keegan was breathing better I laid him down for a nap. Then I listened to that voicemail. She was calling to see how we were doing, how Keegan was feeling, and wondered if the big boys could stay the night at their house. She was leaning in. She was answering a prayer my heart had been to hard to pray, she was answering a text I was too proud to send. Instead, I went to the screaming toddler who was throwing the Leap Pad at the door her sister had shut, I lifted her and carried her to my room and just hugged her till she stopped screaming and tears were streaming down my face. Finally she accepted and reciprocated my hug. Then Amelia came in and joined in the hug. We sat there for several minutes and then I called my mom-in-love and reluctantly shared what life looked like at that moment. And she offered to be His hands and feet. I am thankful to fully known and fully loved, in all moments. Evolution of child raising as evidenced by the progression of parental reactions to Baby throwing up during the night. Firstborn: Baby throws up in basinet. Parents know this because they have been obsessively watching Baby on the video monitor. They have not slept since Baby was born. They immediately call the pediatrician’s after-hours call center. When they do not receive a call back within four minutes they are in the car racing to the emergency room. One parent is driving, the other is in the back seat, attempting to soothe Baby while crying and praying. Baby is not soothed. After many tests the team of drs conclude Baby threw up in bed. Parents consider asking for a seventeenth opinion as they douse themselves in handsanitizer and burn everything they wore in the hospital. Because germs. Secondborn: Baby throws up in basinet. Parents know this because they sleep lightly and heard the cough, gag, spew on the monitor. Both parents roll reluctantly out of bed. Dad gives Baby a bath while Mom leaves a message for the oncall nurse and cleans up the mess and soothes awakened firstborn. Nurse returns call and they make an appointment for Baby to be seen by pediatrician in the morning. Pediatrician says Baby threw up in bed. Mom, who spent the rest of her night staring at Baby and webmd, shares her google findings with pediatrician and offers a detailed medical history, including that one time, seven years ago, when she went on a trip to Mexico, drank the water, and is now breastfeeding Baby and wonders if it is possible that she has transmitted something that was dormant in her system. Pediatrician maintains Baby threw up in bed and considers writing a script for a chill pill for Mom. Thirdborn: Baby throws up in basinet. Mom hears it and wakes Dad to help give Baby a bath, new pjs and new bedding. They throw everything in the washing machine and decide to see how the rest of the night goes before calling the pediatrician’s office. Mom holds Baby for an hour before putting Baby back in bed. In the morning they decide Baby just threw up in bed, and there is no need to call the pediatrician. Mom cancels plans for the next day so Baby can stay home and rest. Fourthborn: Baby throws up in basinet. Mom doesn’t tell Dad, strips Baby’s bedding, decides to wait till morning to clean everything, wipes Baby down with wipes, puts Baby in new pjs and brings Baby into parent’s bed. Next day Mom complains to Dad that she is tired because Baby threw up in bed. Fifthborn: Baby throws up in Mom and Dad’s bed. Mom gets up, grabs a towel, picks up Baby, puts towel on top of throw up, lays back down with Baby. An hour later, Baby has epic blowout. Mom pats herself on the back for already having a towel down, marvels at the miracle that she chose a white towel as it can be bleached (but not during the night. That would be crazy. She’ll bleach it and whatever else needs it by the time this night is over.) She changes Baby and puts down a new towel. Then she and the Baby go back to sleep, snuggled together until Baby wets through his diaper onto Mom who laments that NOW she is going to HAVE to take a shower…in the morning. I like to share stories. I have no artistic bend when it comes to paint and canvas, but bringing moments to life, giving them dimension and color, sharing the mundane that we all relate to and reminding us to laugh and be warmed by our collective human experience, that is what I can share. Too often I let negative interactions with strangers affect me, and sometimes even define me. The jerk flipping me off for going the speed limit, the woman likening my breastfeeding in public to pooping in public, the foul mouthed comments written anonymously about things I care deeply about. The reality is, there are a handful of crappy humans perfectly content to be crappy humans living among us. Their words and choices do not belong to me. Recently, I challenged myself to share 30 days worth of positive meetings with strangers. Clearly this boy should be moved to a management position. Last week, the big four were farmed out at school and Parent’s Day Out, so it was just Keegan and I at the grocery store. A woman came over and admired him and we chatted for a few minutes. She shared with me that she grew up in a family with five siblings and told me she remembers vividly how her mother played with them because she loved children. Her eyes grew sad as she commented how often she observes children starving for attention from parents who are busy staring at their phones. She reminded me to look into my sweet baby boy’s eyes and see the whole world. Today at the grocery store an older woman asked if she could see my baby. He smiled when she asked. She looked at him and I watched as she was transported to the time when her children were small. A woman emits a glow when she is pregnant and carrying her child, and she has the same glow as she carries and recalls her memories of raising a child. She told me that she had two sons born four years apart. Those boys, now men, are her heart’s joy. She shared how much her husband loved their boys. How he played and wrestled with them. She shared that her husband was a strong man whose love for his children had even brought him to tears. She told me that her youngest son now works with a doctor. One day she went to stop by their office to visit with him, but she saw that their office was crowded and told the receptionists not to bother her son, that she would just talk with him later. She was in the parking lot when her son, a grown man with grown children of his own, caught up with her to make sure she was ok and to tell her that he loved her. She had tears in her eyes as she recalled how special that moment was as she considered how she had given this boy spankings and had been firm, even stern with her children. How in those moments when they were young and she had to punish them she worried what the future of their relationship would look like. Ms. Wanda is 82 years young and about to move on to a new chapter in her life. She is going to move and let her precious sons take care of her. Her words and stories touched this momma’s heart. We have five kiddos. The firefighter and I question ourselves constantly if we are doing right by our kids. We are too strict and too demanding in a world that produces Kardashians and trophies for showing up. We have FIVE children. Each completely unique in their personalities, strengths and weaknesses. Just last night the firefighter and I had a “come to Jesus conversation” wondering when we would have the time, the energy, the grace, the patience, the humor, the perseverance, the encouragement, the everything necessary to usher each of them to adulthood. And when they get there, will they still like us? Will they want to spend Thanksgiving at our table? Will they remember how much we laughed? Or is my “tiger face” the only thing leaving an indelible mark on their memories? I am thankful for the Wandas of this world. Angels among us, who have stories to share and take the leap to start talking. I believe we are nudged within our souls to be the difference in each other’s lives. Otherwise, what is the point? Why walk this journey? Why suffer and still persevere? Religion and philosophy are only words on a page if we do not acknowledge that we are the hands and feet and our stories of grace in action are meant to change the world. I have ignored promptings because it is not in my nature to be bold, but the more people pour into me, the more they allow themselves to be vulnerable and share their truths, the greater my understanding of Design.